LUNA X Large Modern Frameless Wall Leaner Full Length Floor Mirror 70" x 30". Venetian style large wall mirror. 70" x 30" or 178cm x 76cm or 5' 10" x 2' 6". 65.25" x 25.25" or 166cm x 64cm or 5' 5" x 2' 1". Colour: Silver Frame Material: Glass Frame Width: 2.25" or 6cm Frame Depth (projection from wall): 1.25" or 3.5cm Approx. 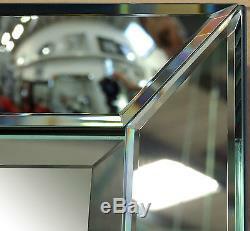 Weight: 22kg Bevelled Mirror Glass? Where is this mirror suitable. Living Room, Kitchen, Hallway, Bedroom, Dining Room, Home office/Study. 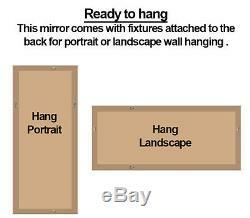 This mirror has 4 hangers fitted to back of frame and can be hung both landscape or portrait. This mirror can also be floor standing. We pride ourselves in supplying our furniture to you quickly. If your order is sent with an overnight Courier we will send you the tracking details. The item "LUNA X Large Modern Frameless Wall Leaner Full Length Floor Mirror 70 x 30" is in sale since Friday, September 25, 2015. 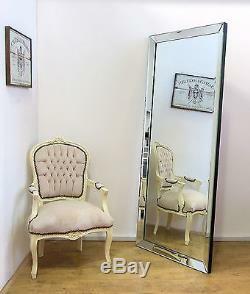 This item is in the category "Home, Furniture & DIY\Home Decor\Mirrors". The seller is "mirrors2home" and is located in Essex. This item can be shipped to United Kingdom. Approx. Overall Size (inches): 70" x 30"